Oh, it’s scrumptious alright! I had a sudden craving for kid birthday party food. Maybe it’s because it’s back to school time and I am seeing all these little kiddos headed off with their oversized backpacks. 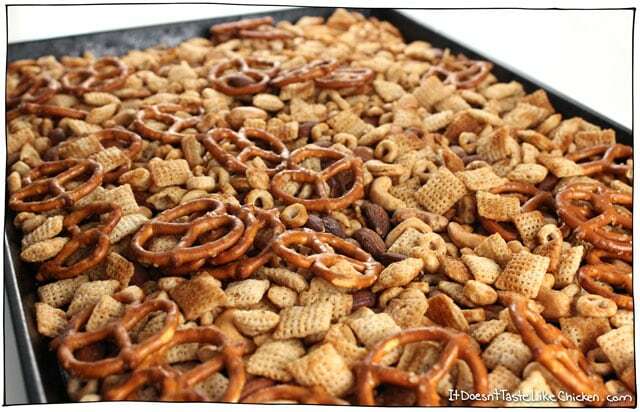 But chex mix, or perhaps you called it party mix. 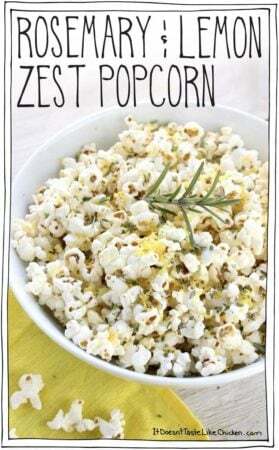 That crispy, crunchy, addictive snack was just screaming my name this week. 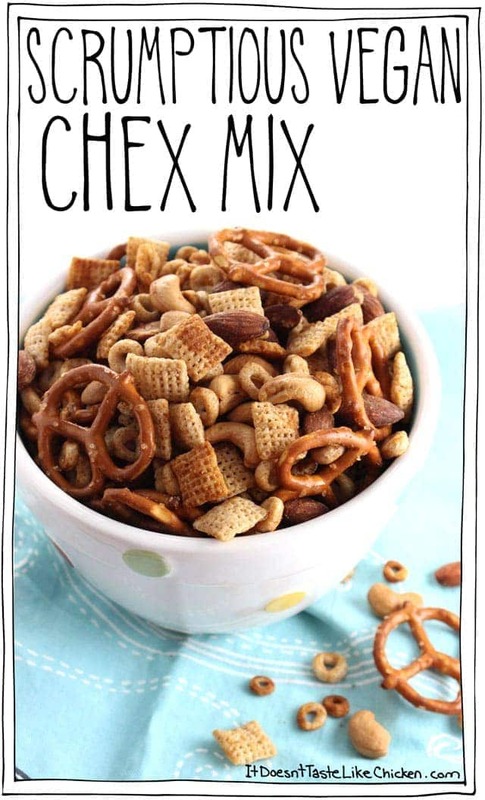 If you are new to chex mix, It’s basically just cereals, pretzels, and nuts seasoned with butter and Worcestershire sauce. 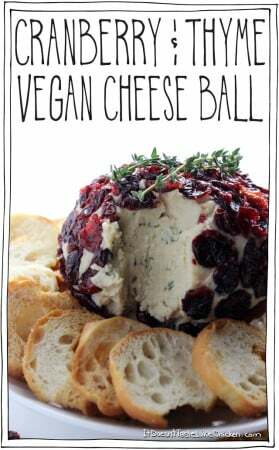 Which of course, makes it not vegan. Not only because traditional butter isn’t vegan, but Worcestershire sauce contains fish. Yeah, I know, yucky! While you can purchase vegan Worcestershire sauce, I’ve never seen it in my grocery store (and you know how I feel about hard to find ingredients)… not my fave. So I drummed up this recipe to have all the classic flavours of the original buttery Worcestershire sauce coating, but of course, totally vegan, and totally easy to prepare. And let me tell you, this stuff is addictive. 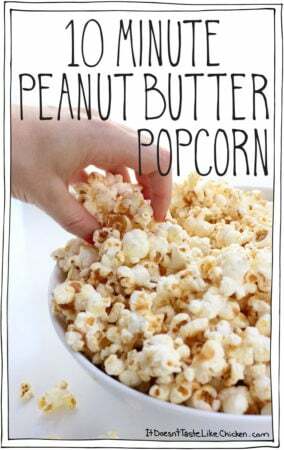 Crunchy, munchy, savoury, umami, and all things snackable. While every piece is delicious, I ended up digging around the bowl looking for the extra dark pieces that had more sauce on them, just like you look for those extra buttery pieces of popcorn. It ends up being the worst game because before you know it, you’ve eaten half the bowl. Scrumptious Vegan Chex Mix for the win! 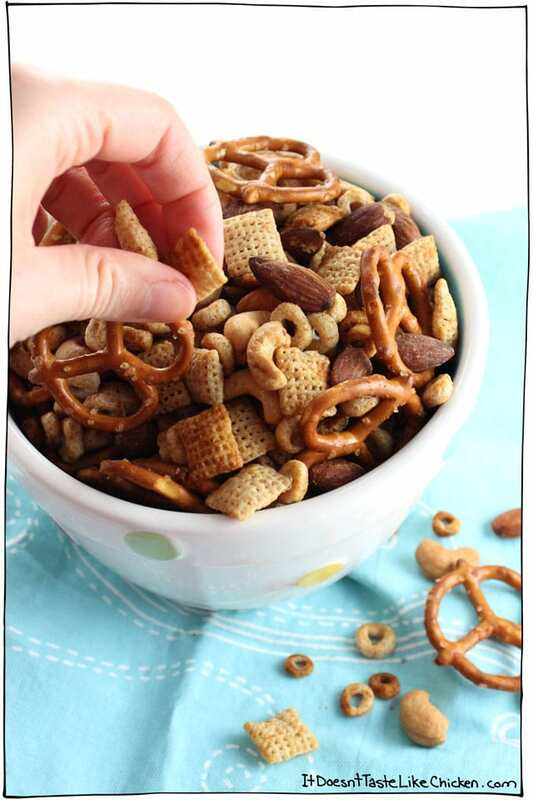 To make Scrumptious Vegan Chex Mix: Add all the seasoning ingredients to a small pot and melt over medium heat. It won’t really mix together too well, and that’s just fine., don’t worry about it. 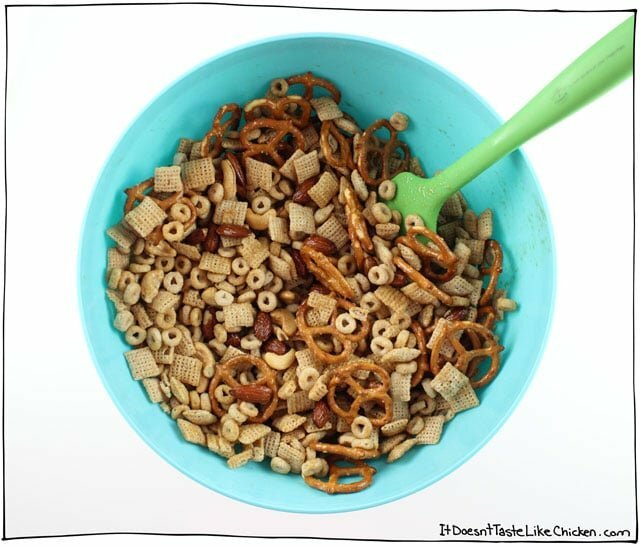 Add the cereals, pretzels, and nuts to a large bowl. 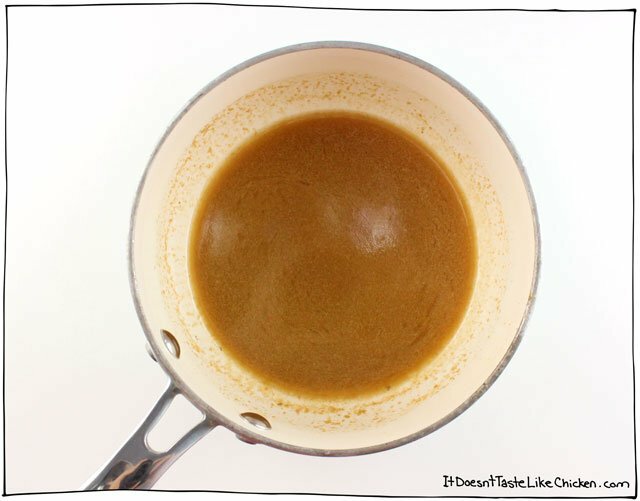 Pour the melted seasoning sauce over the chex mixture while stirring to evenly coat. Spread the mixture onto a large rimmed baking sheet. My baking sheet was a little crowded, but it all worked out fine. If your sheet is smaller you may want to spread the mix across two baking sheets. Bake for 60 minutes, stirring every 15 minutes until the mix has crisped up and become evenly golden. Let cool before serving or storing in an air-tight container. 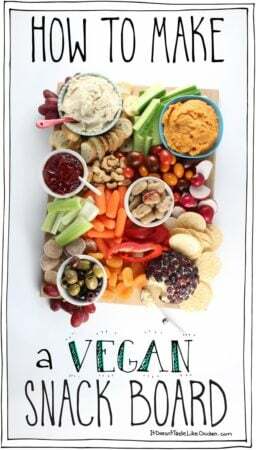 Snack away my friends! 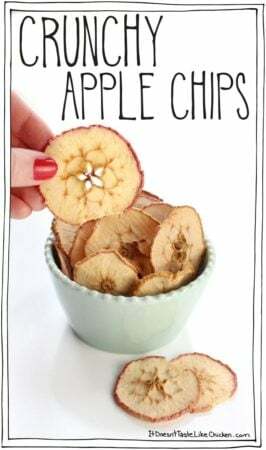 This easy recipe gets all the same flavours as original chex mix without the Worcestershire sauce (which contains fish)! Kid-friendly, perfect for parties. Preheat your oven to 250F (130C). Add all the seasoning ingredients to a small pot and melt over medium heat. Add the cereals, pretzels, and nuts to a large bowl. Pour the melted seasoning sauce over the chex mixture while stirring to evenly coat. Spread the mixture onto a large rimmed baking sheet. Bake for 60 minutes, stirring every 15 minutes until the mix has crisped up and become evenly golden. Let cool before serving or storing in an air-tight container. In Canada, Chex cereals do not contain vitamin D3, but it has been brought to my attention that in the US Chex cereals do contain vitamin D3. D3 is usually made from lanolin and therefore is not vegan. So if you are in the US, look for a similar cereal that is vegan-friendly. 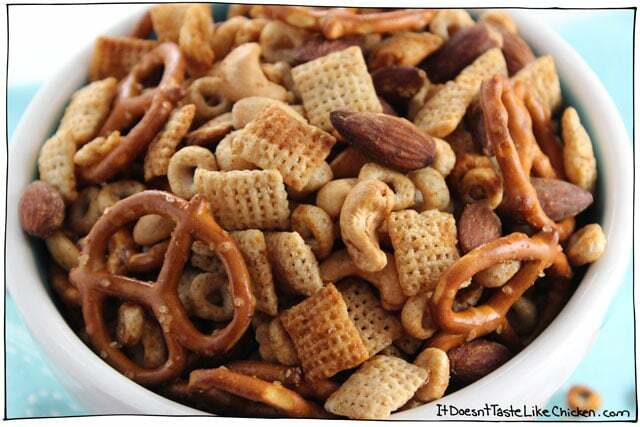 This snack mix was delicious. My son said it tasted just like the kind you buy in the store (that should be taken as a compliment). I live in the tropics, so running the oven for one hour this time of year was highly undesirable. I followed the Chex mix method and cooked it in the microwave, stirring every two minutes. It took me eight minutes total to cook until it was crispy. Thank you for the recipe. That’s wonderful, Dulcie! Thrilled you enjoyed it so much, and the microwave method sounds great! Hey there! So I CAN get vegan Worcestershire and would love to know what would be replaced in the one you’ve given us? It’s amazing and confusing that between the Canada and US, the same foods can be made with different ingredients, i.e. the Chex cereal. Hmmm, I haven’t tried it with vegan Worcestershire so I’m not sure of the flavour change, perhaps replace the soy sauce and reduce some of the spices. I’m sure it will be delicious either way! Ahhh I have to stop looking at your site before lunch… so hongray now! I’ve ordered vegan worcestershire online in the past, but I expect the noochiness of this version will make it even yummier than the traditional recipe! Also I just noticed you’re at Veg Food Fest, hoping I have time to check it out after work on Sunday 🙂 Are you doing a cooking demo, and if so any chance you’ll post a video of it? So exciting, break a leg! Hahaha! I’m sure there are similar cereals that are good to go. And it’s true. I have a huge bag of this stuff in my cupboard now, and it takes everything in me not to eat it all in one sitting! 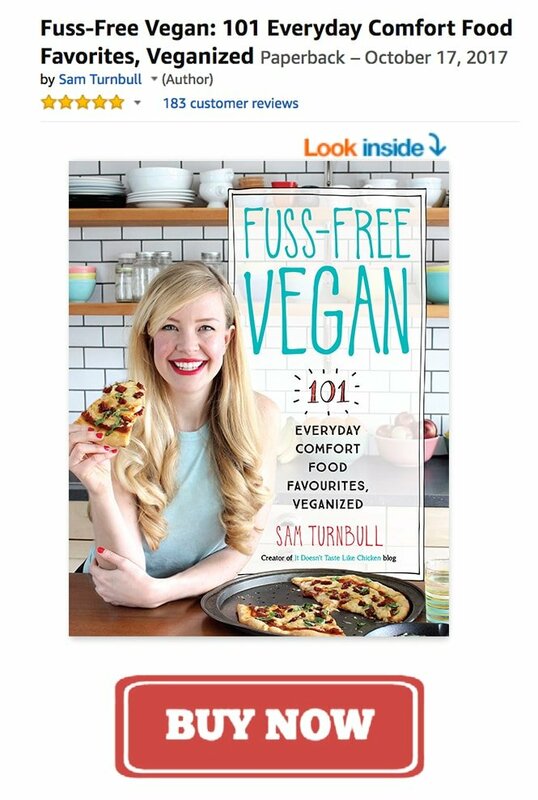 Hi Sam, Just wanted to let you know I called General Mills to see if Chex cereals are vegan. The customer service person said they are not because they contain D3 which is an animal derivative. I ‘m planning to contact them about removing D3 or replacing it with D2. Oh no, that’s so annoying. I just had a look at my box and the ingredients and nutrition info doesn’t include any vitamin D (of any kind) but looked online and the ingredients in the US do contain D3 as you said. So if you are in Canada you should be safe. You can see the nutrition info for Chex in Canada here. I’ve added a note to the recipe for anyone in the US or other countries to use a similar but vegan-friendly cereal. Thanks for pointing that out! Hahaha, yeah a lot of name brand stuff has a completely different recipe depending on the country. Sometimes they even look different! LOVE Chex Mix. Growing up, my mom would make batches and batches of it to give out to family and coworkers during Christmas. She used Worcestershire, but also added soy sauce, the secret ingredient that turned that stuff into crack. 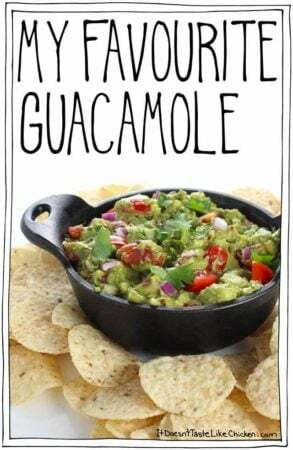 It was so delicious, we’d eat ourselves sick. 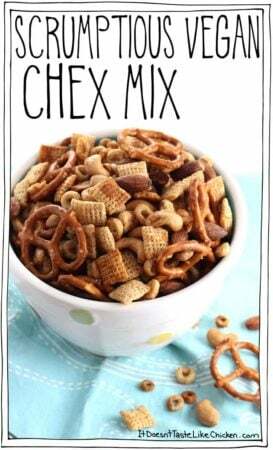 After I went vegan I thought Chex Mix was a thing of the past. Then I found that the Ralph’s store brand Kroger makes an accidentally vegan Worcestershire. Hooray! Excited to try your version too!